Into The Black Forest is the latest title coming to Kickstarter from Green Couch Games. It is a small-box card game with a bit of a classic pub card game feel to it, and will fit right in with Green Couch’s product line, which includes Best Treehouse Ever, Rocky Road à la Mode, and Ladder 29. The game was designed by Jason Slingerland, also no stranger to small-box card games, as his last title was small box card game Unreal Estate, published in 2016 by Grand Gamers Guild. I’ve had a chance to play a preview copy of this game a few times, although I did not play the two-player variant. Note that the prototype copy I played does not have finalized art or design -- although they looked fairly polished to me, other than the bleed margin not being extended enough to fully cover the cards. The game is made up of four unique decks of cards, each numbered 1-12. Each card is one of four suits -- wands, swords, spellbooks, and potions -- and each deck has a unique distribution of the four suits among the 12 cards. There are also 18 encounter cards, six of which will be used each game. 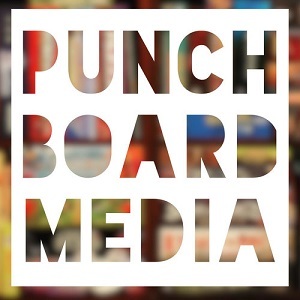 Publisher Jason Kotarski said the stretch goals for the game included more art, a paper score sheet that would upgrade to a folding scoreboard, and basic scoring tokens that would upgrade to custom ones. Into The Black Forest is played over two rounds, with each round having three encounters. In each encounter, players will play cards, in clockwise fashion, around the encounter card, with each area of the encounter card having a unique scoring condition. Bottom: The card with the lowest value scores the value of the other card in the area. There is no winner in the case of tie. Left: The card played here scores its numerical value if the suit matches one of the two cards in the Top area. Top: The card with the highest value scores the value of the other card in the area. There is no winner in the case of tie. Right: The card best matching the variable rule of that encounter card scores six points. There is no winner in the case of tie. Cards played here, unlike the other three areas, are played face down. The top and bottom areas each require exactly two cards to be played, and the left requires exactly one. The right area is variable, taking up to one card from each player. Each encounter ends immediately when all five cards are played to the top, bottom, and left areas. When scoring, the winning cards are removed from the game, while the cards that did not score are returned to their respective players’ hands. At the end of the two rounds, the player with the highest score wins. In the case of a tie, the player with the most cards in their hand is the winner. 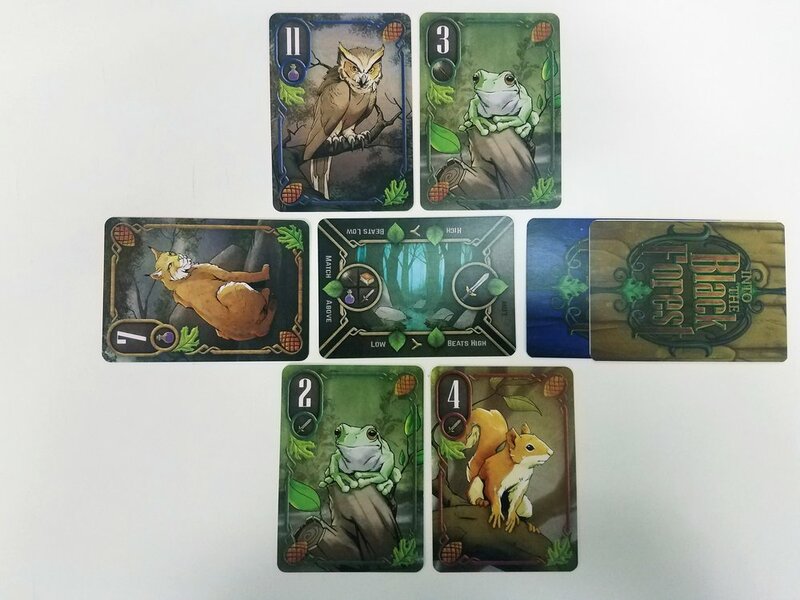 While I appreciate the veneer -- and the beautiful illustrations -- of the woodland animals and the accompanying four magical suit symbols, the theme of Into Black Forest is entirely extraneous, as it’s a traditional numbers-and-suits card game. Since every scoring area is dependent on other cards, there are many opportunities to limit your opponents’ scoring chances, forcing them waste a high card to score very few points. However, making plays like that, while non-optimal for your opponent, also doesn’t score you any points. This creates a decision space of constantly weighing whether the current optimal move is to score a few points yourself, or to block an opponent from scoring a lot of points in a different area. The answer to this will often depend on who is currently winning, what cards players have already scored and discarded, how close the encounter is to ending, and how many encounters are left in the game. Despite all the decision weighing, it’s a quick game. With six total encounters, each with players only playing one to three cards, there is not a lot of time to score points, which makes the fight over scoring opportunities that much more urgent. Despite how fast it plays, the game’s levers and counter-balances are not particularly intuitive at first glance, but are revealed through trial, error, and experimentation over the course of multiple plays. Additionally, the game rewards players paying close attention to every card being played, understanding the relationship between the scoring areas, and, ideally, remembering which cards were scored and subsequently discarded. This game will not be for everyone. It will be too unintuitive for some, too limiting for others, and not thematic enough for others still. But what I found interesting about Into The Black Forest was a feeling, right after playing, that I should immediately play it again, with an aim of being more clever, and trying different cards at different junctures to better effect. Overall, the game’s classic feel, unique gameplay flow -- I’m at a loss to compare it to any other card games I’m familiar with -- and addictive, let’s-try-one-more-time component, make it worth seeking out and playing. Full disclosure: I received a preview copy of Into The Black Forest from Green Couch Games. The Into The Black Forest Kickstarter campaign can be found here, and is running until September 30.